Harrison's High Potency Course is a year-round diet for all medium to large parrots especially African greys, cockatoos, large conures, eclectus, macaws and pionus. Other species may be switched to Harrison's Adult Lifetime Course after a 6 month period. 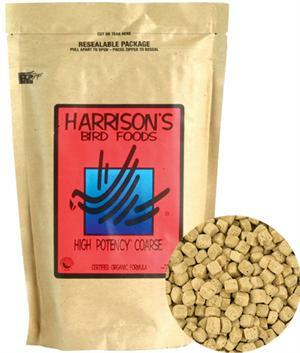 Breeding Birds: Birds should be fed High Potency Diet 1-2 months prior to the breeding period and until chicks are weaned or for at least six months before resuming Harrison’s Adult Lifetime formula. Suggested especially for African greys, cockatoos, large conures, eclectus, macaws and pionus.